Our emergency department team includes Dr. Pete Zopfi, Heather Venezio, Daman Mott and Dr. Seth Kaufman. 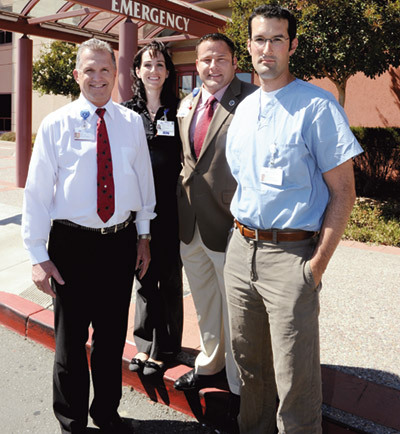 Twenty years ago, NorthBay Medical Center was the defacto trauma center for Northern Solano County. Back then, physicians were required to handle emergency calls 24/7, in addition to their regular practices. It just went with the territory. Because the burden was so great, many doctors didn’t mind when helicopter companies offered to swoop in and deliver trauma patients to bigger, metropolitan hospitals. But not Pete Zopfi, D.O. NorthBay Healthcare’s new trauma medical director has always thrived in urgent situations. He trained at a large hospital in Dayton, Ohio, and saw more than his fair share of tractor and hay baler accidents, as well as motor vehicle accidents and the “knife-and-gun club” variety. He learned to be ready for anything at any time. But one doctor does not a trauma department make. Other changes on the medical landscape had to occur in the past decade to bring NorthBay Healthcare to where it is today: Poised to answer all except the most extreme trauma calls. Now a team of trauma-trained community surgeons, backed by a full field of hospitalists, stand at the ready to deal with everything from broken bones and dog bites to gun shot wounds and industrial accidents. “Many of the advanced services we already provide, from our Chest Pain Center to our Stroke program, make the transition in trauma planning seamless,” says Daman Mott, director of Emergency Services and Trauma. Actually, NorthBay’s Emergency Department staffs have always handled any trauma that arrived at their doors. Some patients just walk in, while others are driven to one of the local facilities. But when 9-1-1 is called, and patients are picked up by ambulance or helicopter, emergency medical service workers follow protocol, and some conditions require that patients be sent out of the area for help. NorthBay has been in the planning stages for several years now to become a Level III trauma center, which means that all but the most serious neurological cases can be handled locally. Dr. Seth Kaufman agrees. As NorthBay’s Emergency Department Medical Director he sees a strong benefit for Solano County trauma patients. Developing the system has involved a number of mock drills, involving real people playing the role of patients, and simulated patients or mannequins, which are programmed for the exercise. “It may be a mannequin, but it can be as realistic as the real world. You have to think on your feet and respond quickly or you’ll lose your ‘patient,’” says Zopfi. Even though the Level III trauma facility will only exist at NorthBay Medical Center, at least in the beginning, Mott wants his entire Emergency Department team—52 staff members at VacaValley Hospital and 70 at Fairfield—to be fully trained and capable of stepping in. “If someone gets hurt and has to be taken to VacaValley Hospital because it’s the closest, I want them to receive definitive care and appropriate, timely transfer to the closest trauma center,” he says. That transformation is a familiar sight for Vice President and Chief Nursing Officer Kathy Richerson. She joined NorthBay in 2000, after helping Mercy San Juan in Sacramento become a Level II trauma center. She knows the challenges well. First, NorthBay had to make certain that becoming a trauma center was in the best interest of everyone: the patients, the community, staff, physicians and for the nonprofit NorthBay Healthcare. “Trauma has to be a fiscally responsible decision for the organization. We have to weigh the mission to the community and our ability to sustain an intense, highly technical program,” she explains. In fact, NorthBay Healthcare was the first hospital in the area to declare an interest in establishing itself as a trauma center. Combine those trauma-trained community surgeons and hospitalists with Emergency Department physicians, nurses, techs and support staff who have now all been trained to handle trauma cases and you have a team that’s not only excited about the prospect, but capable to respond at a moment’s notice. Dr. Pete Zopfi is the perfect choice for the trauma director for the new NorthBay Trauma Center. He is an excellent surgeon. When I was first diagnosed with a ventral hernia, everyone in my family — who are also overweight — told me no doctor would perform surgery to repair it because of my weight. At the first consultation, Dr. Zopfi didn’t blink an eye as he scheduled me for the operation. Plus,he made me feel that everything would be OK. And it was. Pete Zopfi also has extraordinary leadership skills, which is I why I tried — unsuccessfully — for many months after that first surgery, to recruit him into my Kiwanis Club. There is no doubt in my mind that with Dr. Pete Zopfi at the helm, the new NorthBay Trauma Center will be a success.